This website takes you to an inspiring journey of creativity with beach stones and pebbles. I've created it to share with you my love for these natural treasures we find on beaches all over the world, both humble beach pebbles and semi-precious beach stones, and which only recently have been fully appreciated by our modern society. Crafters and artists, parents and teachers, those who treasure nature and the beach, those with a passion for writing and creative makers of any age. Here you will find ideas for arts and beachstone crafts and you will get a chance to exercise your creative writing skills. You will also find some unique and exciting pebble art ideas for all sorts of creative activities for kids, to do indoors or outdoors. And if you are interested in decorating your home and garden with great-looking stones from the beach, for a natural look and positive energy, there are ideas and tips for that too. You will learn how to get inspired by different types of beach stones and pebbles and how to use this inspiration to get kids and other people inspired by them too. There are also ideas and tips on how to teach children some important life skills and creative inspiration techniques, using beach stones and pebbles. Please, keep in mind that this is not a site for children, though - You are also strongly advised not to ever leave kids unattended, no matter what kind of activity they are in. 1. They make connections and generate a feeling of belonging to nature. The history of the geological origin of beach stones connects the present to the past. Beach pebble activities connect us to our friends and families and other fellow humans. Creative group activities, like charity crafts, could bring us a step closer to building our compassionate society of the future. 2. They are great for meditation. They offer healing through feelings of peacefulness, serenity, harmony, and freedom, which we experience when making minimal art with them or using them in zen décor projects. And, they inspire a new approach to everyday problems, a new positive attitude, a new harmonious way of life. 3. They are frugal. 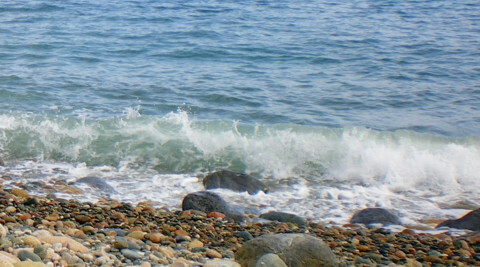 Humble and cheap, or at no cost at all, beach stones and pebbles are the answer to today’s difficult economy. They can be put to a good number of uses – click on the links of this website and find out the things you can do with them. 5. They are fun to be creative with for everyone. All ages and both women and men are attracted to them. 6. They unleash your creativity and ignite imagination with their form, shape, texture or history. 7. They offer ecological solutions for gift making, home decorating (outdoors or indoors), new business ideas, interesting and creative hobby ideas. So take the journey - start experimenting and creating with beach stones and pebbles. Help your kids, whatever their age, learn to appreciate them too. Call your friends to join you. Living is giving. Nature has given us the beauty of such beach treasures. We only need to open our eyes and be thankful for this gift. It is now our turn to use our creative forces and turn beach stones into a gift of our own to our friends, family or the whole world. And if anyone asks you “Why beach stones and pebbles?” tell them to visit this website. This site believes in the timeless beauty of nature and is dedicated to serving this beauty. It is also dedicated to opening new roads for your imagination, roads that will enable you to make your bond with nature stronger. How? By deepening your appreciation of beach stones and pebbles so you incorporate them in your living space, allowing them to become part of your well-being. Whatever you want to do with rocks and pebbles from the beach, remember that you should, first, have some basic knowledge on what rock types they are. In some cases, like when you're interested in making jewelry, you should be able to tell if a beach stone is a gemstone or not. So start your journey with the important information on beach rocks and pebbles identification given in the links below. "All human wisdom is summed up in two words - wait and hope"
Beach Stone Crafts Ideas, Beach Stone Art, Pebble Crafts ProjectsIdeas for beach stone crafts. Tips for beach stone art and pebble crafts projects for all. Beach Stones Decor Ideas – Decorating with Beach PebblesInterested in beach stones decor ideas? Need some beach pebbles decor tips? Learn how to decorate your home and garden with beach stones, beach pebbles, natural rocks. Be Frugal with Beach Stones - Frugal Ideas for Activities, Decor, GiftsLearn how to be frugal with beach stones gifts making ideas and other beach stones activities. Get some creative money saving tips with beach stones frugal arts and crafts decor. Beach Stones Activities for Kids - Creative and Fun things to doIdeas for fun beach stones activities for kids indoors and outdoors, crafts, art, writing, gift making with beach rocks and pebbles. Beach Stones Inspiration Tips and IdeasNeed new inspiration? Try beach stones inspiration. Here you will find ideas and tips on how to get inspired by stones for your crafts, art, decorating, writing and other activities.